Time really flies. It’s already 13 days into 2018. Time to make New Year Resolutions. I have had a good rest since I got back from Italy 3 weeks ago. There was not much teaching and my second semester of French classes will only start next week. It will be a hassle to wake up at 6.15am for 3 consecutive days of the week to get to my 8am French classes. However, I couldn’t wait for them to start so that I could save whatever French I have left. I have not been speaking French for almost a month and I can feel my French slipping away to nothingness. During the few occasions that I got to communicate in French, I felt that I was stuttering, rather than speaking the language! Selfie – Last run of 2017 at my favourite bassin. Bit of a muddy run as the region was pelted by heavy rain from Tempêtes Carmen and Elenor. 1. Recover and Run more, and hopefully faster. First, I need to ensure that my metatarsal fracture will heal completely while I am preparing for the marathon. Then, I need to regain my previous strength and speed, and hopefully improve on them. Instead of re-joining the 3-time-a-week training with the Competitive group in Orsay running club, I have decided, at least temporary, to switch to the 2-time a week with the Leisure group. One of the reasons (which I do say, is very valid) for the switch is that I do not want to worsen my injury with too-much, too-fast, too-soon training. Yet, deep down in my heart, I know that the crucial point is that I do not wish to subject myself to the mental stress of forever playing a game of never-be-able-to-catch-up: even if I were 20 years younger, I would never – let’s not say as fast as as those long legged (most of them) youngsters (teenagers! 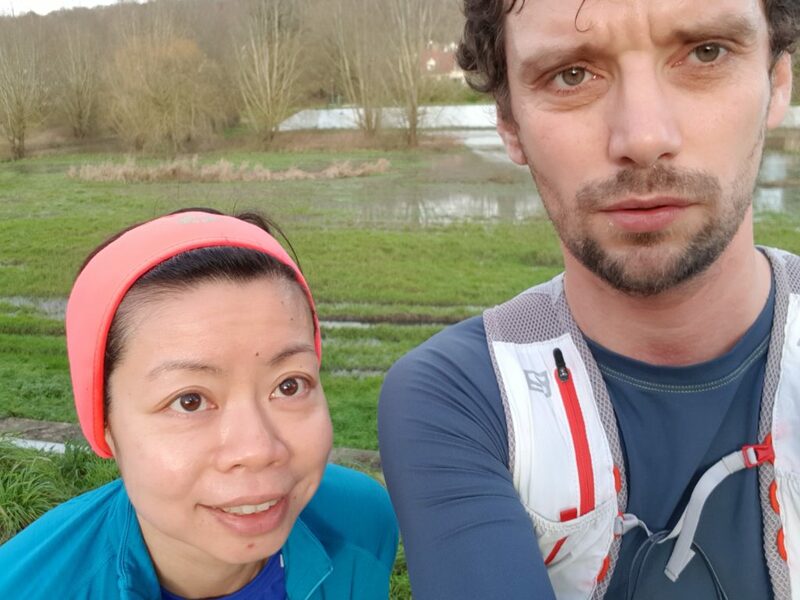 to a few in their early thirties), who run like antelopes – be able to narrow the gap between them and I.
I have already run twice with the Leisure group. Most of them are about my age or older, and I am definitely not the slowest in this group (the stress factor plunges!). The dilemma is that the Leisure group, as the name suggests, it’s more of a social running group, and not training like crazy for lung-bursting, legs burning races! There are workouts in these 2-time-a-week sections, but they are easier that the training I had before, and the group is not as motivated as the other one (duh! the former is not training for competition!). Annual king-size Galette des Rois at my favourite boulangerie. 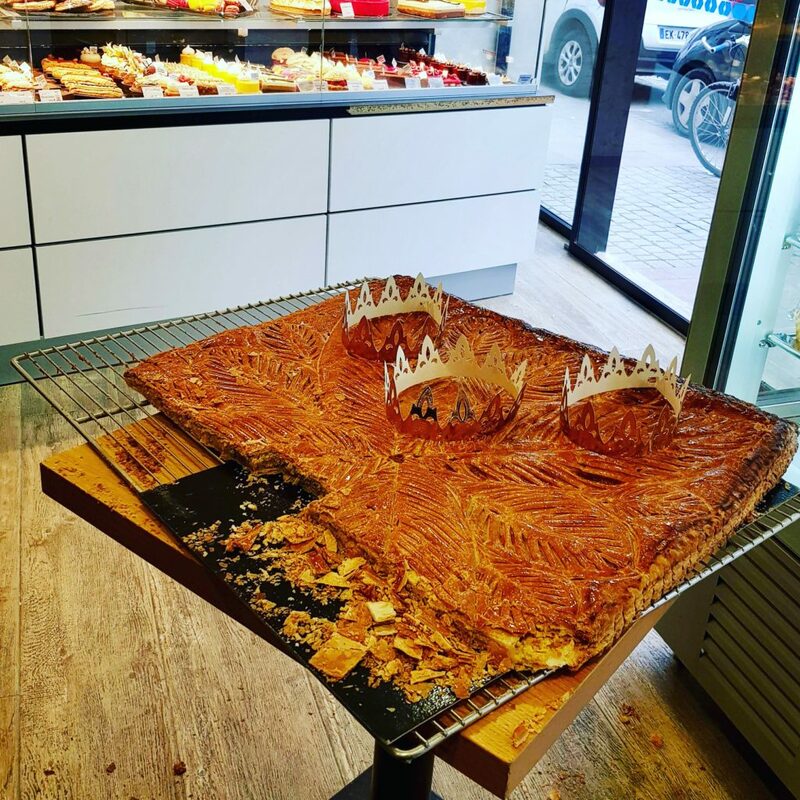 Last, but not least, I need to lose the 2kg tyre that I gained by gorging on festive foods…the Cake of Kings (Galette des Rois), a dessert that combines buttery, puff pastry and an almond paste filling, is not helping me. A grey and rainy day in France, which was later brightened by the colours from the MoMA works. Top left (anti-clockwise): Louis Vuitton Foundation. Gustav Klimt – Hope II. Ellsworth Kelly – Colors for a Large Wall. Mark Rothko – No. 10. During my family’s visit in Paris, my father asked me why I insist on staying in Paris where everything looks so “old”, lacking the modernity and comfort of home. His question kinda of caught me by surprise, but after two seconds of reflection, my answer was: it’s exactly the “oldness” of the city that attracts me. I think I have always been attracted by narrow streets, tiny alleys (excluding, of course the boulevards!) and the charming, four-to-five storey old apartments, some lucky to have iron-wrought balconies with floor-length windows, mansard roofs with dormer windows. My attraction for Paris started 20 years ago, when I first moved here as an au-pair. Back then, I was living right in the centre of Paris. Without the help of GPS, but only a pocket-size road directory, I managed to find myself around this city, often getting lost in her myriad streets. Don’t people always say that the best way to get to know a city is to get lost in it? I remembered that I used to visit more museums (visited Louvre three times by taking advantage of the free admission on every first Sunday). So, in 2018, I would like to get to know more about Paris. I would like to discover her obscure little corners that are unknown to the tourists, or even to the Parisians. I would also like put the history class at Sorbonne Nouvelle into good use. Last month when I was in Paris, I came across a square that is called Place du 18-Juin-1940. I was so thrilled, as I could proudly tell my husband the significance of that date: It’s what they called “L’appel du 18 juin 1940”, the telephone call of 18 Juin 1940, the day in London when General Charle de Gaulle called out to the French to resist surrendering to the Germans during the Second World War. 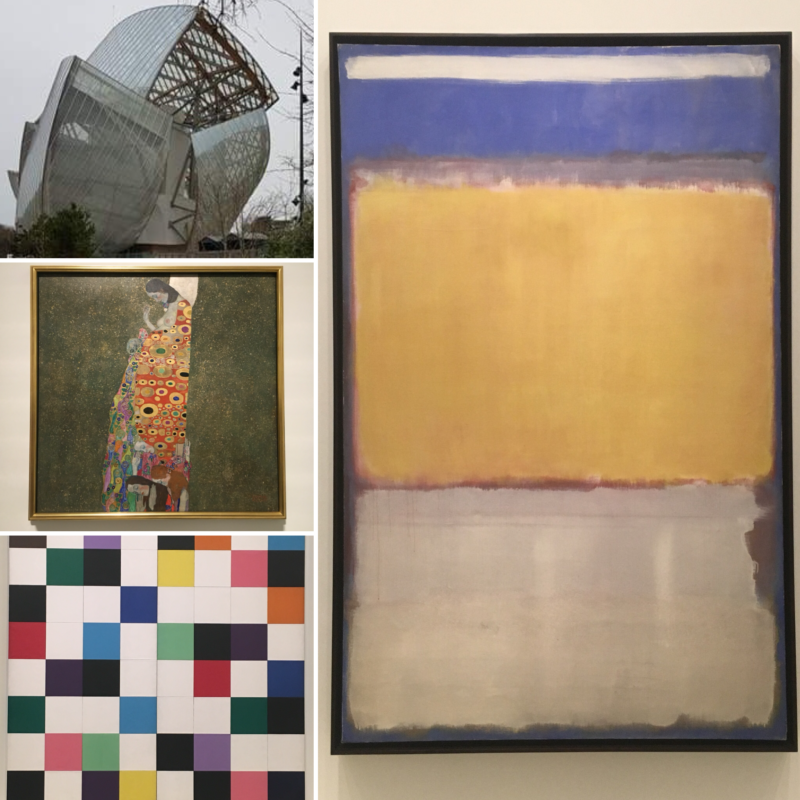 We visited Louis Vuitton Foundation on the first week of 2018, definitely a good way to jumpstart my resolution! Until March 2018, the Foundation is exhibiting 200 works from Museum of Modern Art (MoMA). The exhibition presents us an opportunity to visit the Frank Gery-designed building, which we bypassed during our Paris Marathon. At that moment, I don’t think neither Silviu nor I were in a mood to appreciate even the facade of the building, as we struggled with the last 2km of the race. This will be a permanent new year resolution. To make it more interesting, Silviu and I have re-discovered Scrabble. 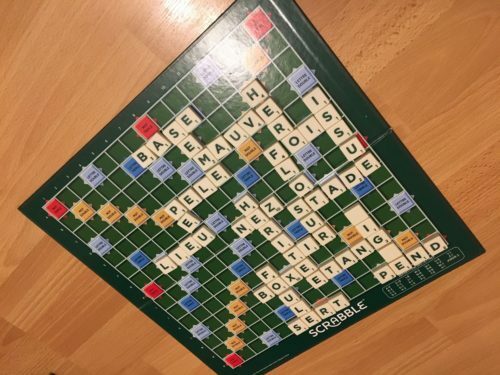 That’s how we welcomed in 2018 – pitting in French Scrabble. People are happier when they are content with what they have, and not dwell into what they do not have. This is something that I really have to learn, and put into use. I have to admit that I get stressed easily. Slightest inconvenience, discomfort, schedule hitches can get me stressed. Not having prepared my English teaching lessons in advance; leaving my French homework to the very last minute; training with the Competitive running group; running with the Leisure group may not help me with my marathon training; not having a permanent, office-based job like those that I had before coming to France; worrying that not working in some higher-paid jobs in the financial industry is wasting the education that my parents provided me…la di da di da. I often tell myself that I should relax. At my ripe old age, I have the prerogative not to worry about what others thought of me. I have enough teaching experience and materials to teach a class even if I have not prepared the class in advance (Note: I always prepare my classes though!). So what if I miss a few of my French homework – I had my share of heavy duty studying decades ago, studying French now should be fun for me! So what if I am the slowest in the running group – I don’t aim to be a professional runner? So what if my second marathon timing is worse than the first one – no adverse side effects other than my pride as a perfectionist? Of course, it’s always easier said than done. Is it really possible not to worry about stuff? However, the good thing is, I found that just by writing down my thoughts here on this blog helps to de-stress me. Perhaps, another resolution will be: be more disciplined and write more often!